Base price per 100 ml: 33,28 €. Aloe Barbadensis Leaf Juice (Stabilized Aloe Vera Gel), Water, Hydrogenated Jojoba Oil, Propanediol, Glyceryl Stearate, Bambusa Arundinacea Stem Powder, Sodium Cocoyl Isethionate, Cetyl Alcohol, Cocamidopropyl Hydroxysultaine, Stearyl Alcohol, Decyl Glucoside, Stearyl Phosphate, Hydrated Silica, Hydroxyacetophenone, Caprylhydroxamic Acid, Caprylyl Glycol, Ethylhexylglycerin, Papain, Bromelain, Maltodextrin, Vitis Vinifera(Grape) Juice Extract, Citrus Limon (Lemon) Peel Oil, Polyacrylate Crosspolymer-6, Sodium Lactate, Phytic Acid, Xanthan Gum, Disodium EDTA, Chlorphenesin. Your body gets rid of 30,000 to 40,000 old skin cells every single day. Even with a consistent cleansing routine, your skin sometimes needs helps sloughing off dead skin cells and debris. Old skin can look flaky, tired and dull. Help your skin look brighter and smooth tone and texture by getting rid of the old without stressing the soft, newer skin underneath. Jojoba beads, round in nature, gently roll across your skin to remove debris. Sustainably sourced Bamboo powder sweeps the skin to remove dead skin cells. Bamboo is a large granule, so that it doesn’t scratch the surface of the skin. Extracts like bromelain, papain and lemon essential oil are mother nature’s tonics. 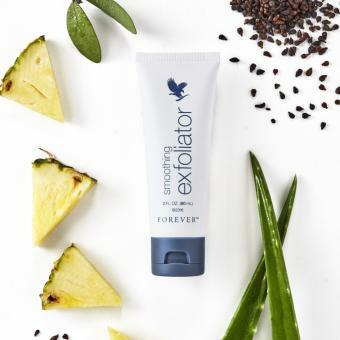 Obtained from pineapple, bromelain’s enzymatic abilities assist in destroying the keratin of dead cells, which helps them be removed more easily. Papain, from papaya, assists in rejuvenating skin and is a rich source of vitamins C, A, E and pantothenic acid. Lemon essential oil is a rich moisturizer to instantly start hydrating the younger skin underneath. These resurfacing ingredients are also paired with antioxidants like grape juice extract to make the most effective yet gentle exfoliating experience and reveal moisturized, softer and fresher skin. 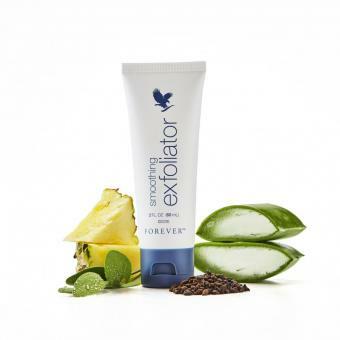 Plus, exfoliated skin is better able to absorb key ingredients in any topical applications that follow, thus helping you make the most of your Forever skin care routine. Datasheet : Smoothing Exfoliator Smooths Skin’s Tone and Texture 559, 60 ml (PDF) -> Open in a new window.